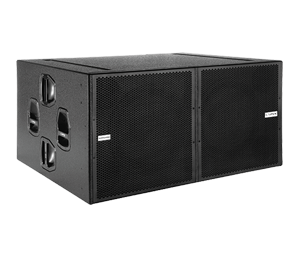 Extremely high power, Self-powered Class D with PFC (Power Factor Correction), three-way Line Array. Dual LF 12” (4” interleaved sandwich voice coil) neodymium woofers with double demodulating rings, Four MF 6.5” transducers with glass fiber cones & ultra-light voice coil and two HF 1.4” neodymium magnet drivers with titanium diaphragm and individual high precision wave guide. 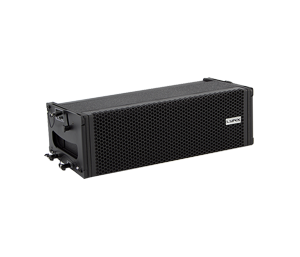 DSP (FIR technology) controlled with 4000W amplification, 143dB SPL, built-in inclinometer. 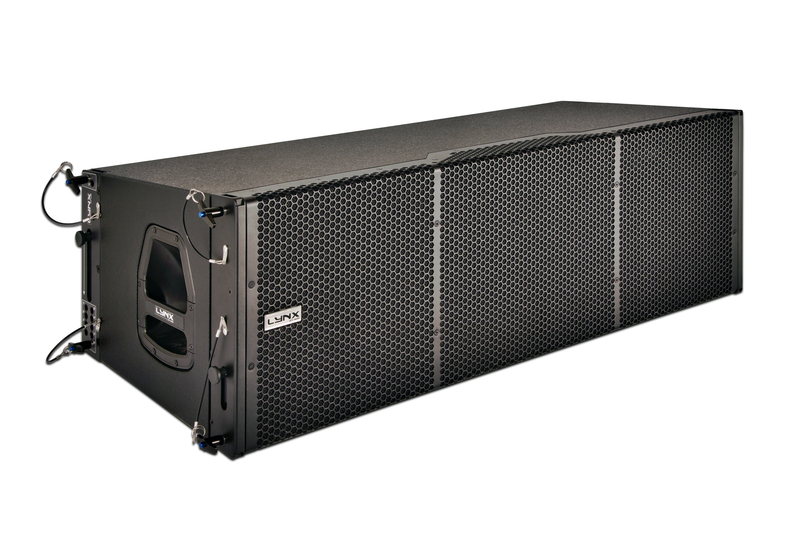 The LX-V12 is the ideal solution for application in theatres, concert halls, stadiums, auditoriums, conference halls or any event where high precision Line Array is required. 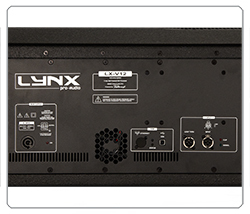 The LX-V12 is a very high output three-way self powered cabinet. 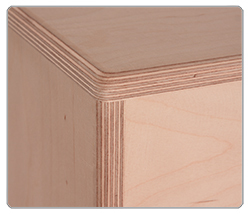 Each cabinet has a DSP integrated which applies linear phase (FIR) and classical crossovers. 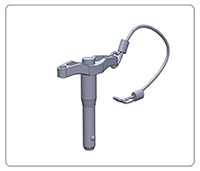 Other features include temperature sensor, fan speed control, inclinometer, Ethernet options and many more. 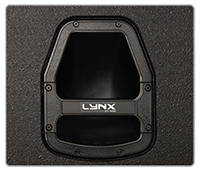 The LX-V12 has a selection of rugged hardware available. 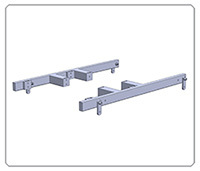 The SV-LXV12 flying frame can hold up to 16 cabinets with splay angles selectable in 0.5o increments between 0o to 3o and 1o increments between 3o to 12o. 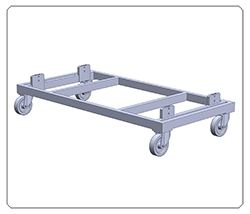 The CA-LXV12 transport dolly can house up to 6 cabinets and a nylon protection cover is also available. 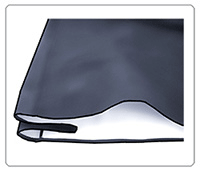 Rain hoods are also optional to protect the system electronics. With a very high power to size ratio and with easy rigging options offered the system can be taken from the truck and rigged up in record time. 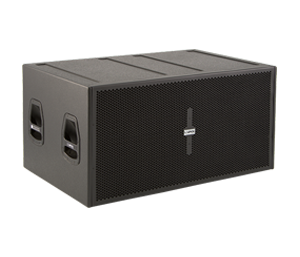 It is also very easy to use and control without the need for any external amps. 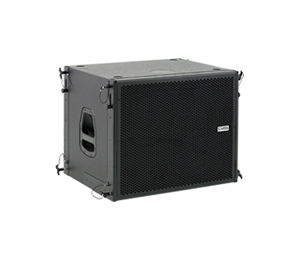 To extend the low frequency response, the LX-318C Cardioid sub bass is recommended. 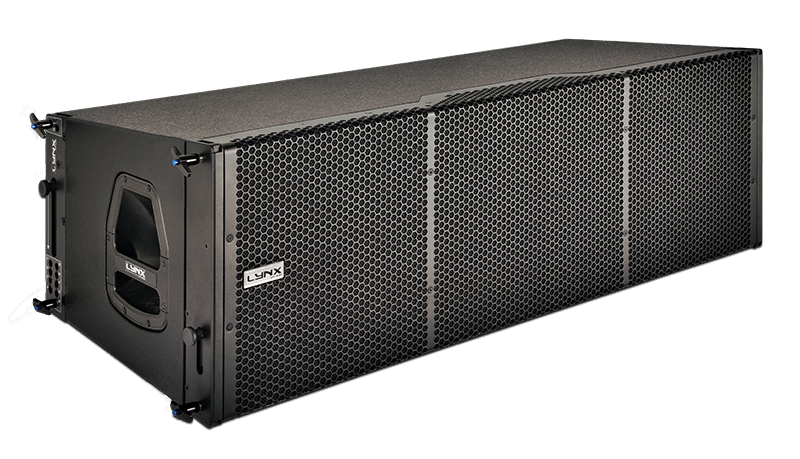 The internal structure of the LX-V12 is heavily braced for greater longevity and all parts are assembled on metal inserts with metric screws. 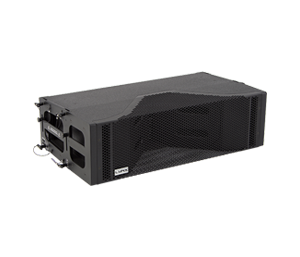 The amplification modules & DSP are housed in a separate chamber to the drivers avoiding excessive heat & vibration, thus delivering greater efficiency and reliability. 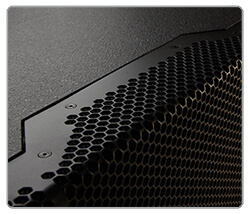 The LXV12 has a heavy duty, powder coated front grille with a special acoustic rear fabric to protect the transducers against dust and dirt. An ergonomic, die cast handle with firm internal grip is located on each side of the LX-V12 enclosure to facilitate transport, positioning and loading of the cabinets. 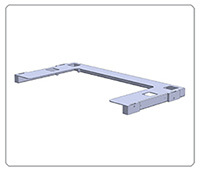 Integrated flying plates are located on each side of the enclosure, to link LX-V12 cabinets together with optional splay angles, from between 0° to 8.5° with 0.5° step increments to create the desired curve. 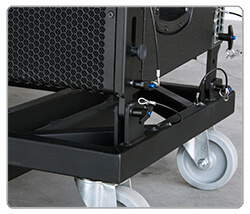 The LX-V12 is easy to transport thanks to its dedicated Dolly. 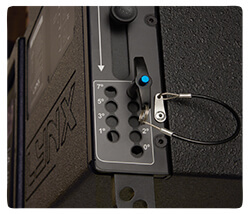 The cabinets lock in 4 points on to the dolly and a protective nylon cover is also available to protect the enclosure and keep it clean on tour. 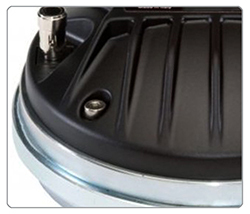 For the low frequencies it uses dual 12” neodymium transducers with 4” interleaved Sandwich Voice Coil (ISV), Double Demodulating Rings (DDR) for lower distortion and improved heat dissipation, weather protected cone & plates for outdoor use with onboard heatsink for improved dissipation. 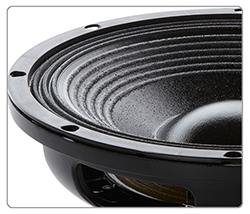 The mid range is looked after by four 6.5” transducers with glass fiber cones for natural sound, low harmonic distortion & ultra light weight aluminium voice coil. 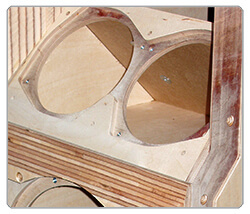 The high frequencies use two 1.4” neodymium magnet drivers with titanium diaphragms increasing the life of the components, short copper cap for extended HF response. 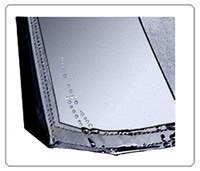 Each driver fits its own individual high precision wave guide. 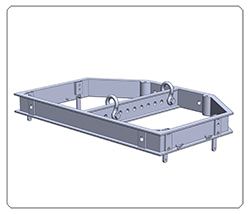 You can use this frame for ground stack or rigging of up to 24 cabinets. Bi-amplified Class D with switching power supply and PFC (Power Factor Correction). With PFC the power supply regulates itself when AC mains change, so the amp power output will not change with mains swinging. 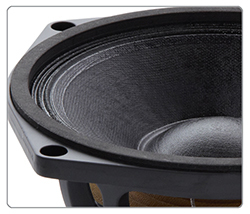 The amplification far exceeds the transducers needs thus resulting in high output, high damping factor and extremely low levels of distortion. This system is also very environmentally friendly with a reduction of approximately 40% of current draw. 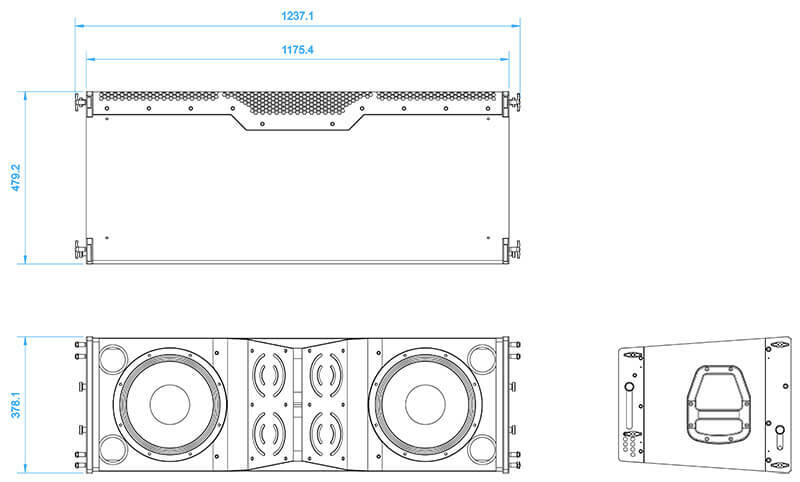 Includes two power modules, one (800W) for the speakers and other (600W) for the HF drivers.